The All Terrain Trekkers and Cross-Country Klub (ATTACK), biking and outdoor club now in its 12th year of inception is inviting you to be part of Cagayan de Oro’s Mountain Biking history. UPDATE: Race Rules and Regulations. * Update: Rules and regulations below. Click here. 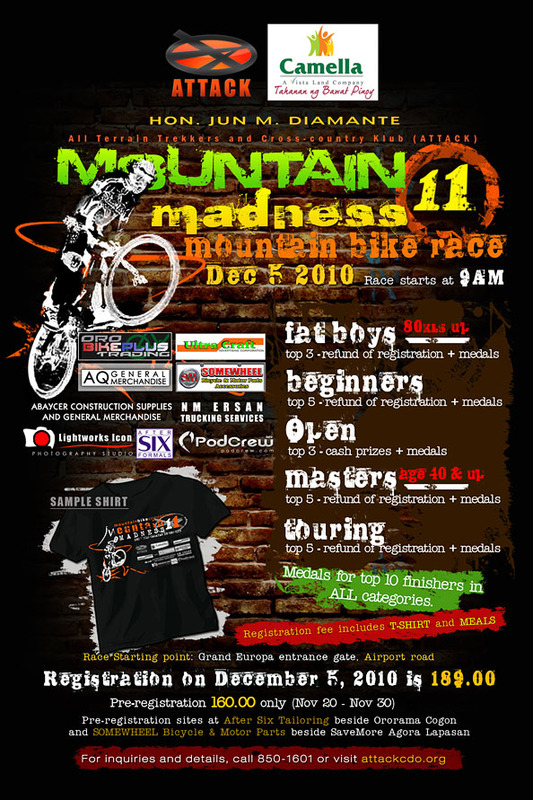 ATTACK will be holding a Mountain Bike Competition on December 5 2010. The “Mountain Madness 11” mountain bike race event will be participated by mountain biking enthusiasts from nearby cities and provinces and it’s now on the 11th race of its series, since its beginning in 1998. Registration during the race is P189.00. But if you register early between November 20 to 30, you’ll be paying P160.00 only! After Six Tailoring, located beside Ororama Cogon. SOMEWHEEL Bicycle and Motor Parts, beside SaveMore, Agora, Lapasan. There will be MEDALS to ALL TOP 10 FINISHERS in ALL CATEGORIES! 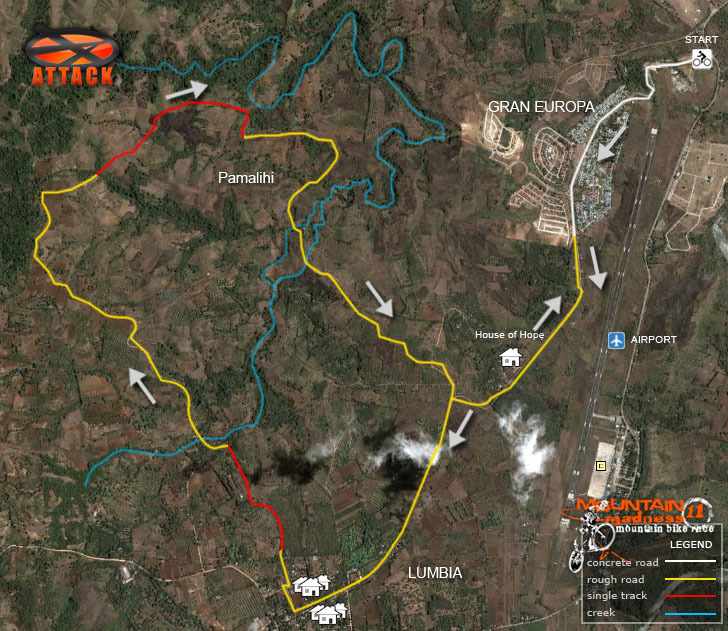 Race starting point: Gran Europa entrance gate, Airport road. MOUNTAIN BIKES ONLY. Rim sizes 24”,26” and 29” only. HELMET or head protective gear is a must. NO HELMET NO RIDE. All are encouraged to wear standard cyclist gear such as jersey and cycling pants but not required. Water bottles and other emergency tools is a must i.e air pump, patch kit or extra inner tube. Race will start at exactly 9.30 am or before. All participants are required to be at the starting line two (2) hours before start-up for pre-race and markings. All riders must be ready with their bikes and rider numbers placed in the designated position at the front of the bike and the back of the rider. The race course is provided with Directional Arrows / Markings at strategic locations for proper guidance. It is the responsibility of all riders to acquaint or familiarize themselves with the race course. No complaints will be entertained later regarding lost riders. This is a survival race. Outside support whatsoever is not allowed. The rider should bring along all tools, spare parts, water, food and etc. Riders are allowed to stop, rest, push, walk or carry their bike provided they do not deviate from the route. Riders are not allowed to ride any form of vehicle other than the bike. FOUL PLAY, rough riding or any unsportmanlike action by a rider or his/her support crew. Blocking. A rider who creates interference to prevent others to pass safely. Deviation. A rider who uses short cuts to gain advantage. Dependent. Biker who uses outside help to propel his bike. The rider must check-in with the finish line official immediately upon arrival. RACE OFFICIAL / MARSHAL reserve the right to disqualify any participant, as they deem necessary. Their decision is final and executory. All protest should be submitted in writing to the race official within one (1) hour after the end of the race. A protest fee of ONE THOUSAND PESOS ( P 1,000.00 ) is required. If protest is found valid, fee is refundable. The organizer reserves the right to reclassify or disqualify any riders as they see fit. 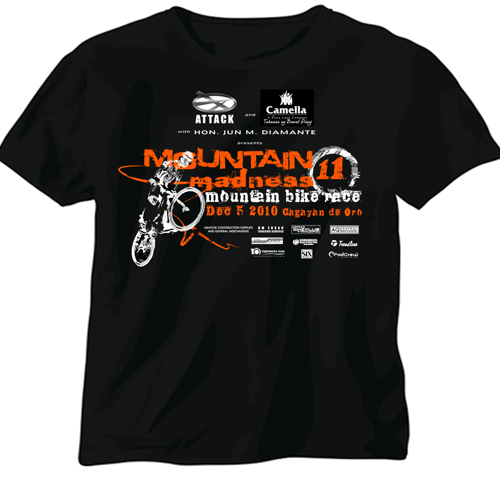 REGISTRATION FEE IS ONE HUNDRED EIGHTY-NINE PESOS ONLY P 189.00 for Mountain Madness. PRE-REGISTRATION will be accepted at the designated registration sites starting on November 20 TO November 30, 2010. After which registration will be done on the race day itself in the area near GRAN EUROPA ENTRANCE , MASTERSON AVENUE, LUMBIA, CDOC. (going to AIRPORT). A particular category may be eliminated, revised or added prior to the race start as the organizers sees fit. 10. ANY clarification regarding to the Rules and Regulations are welcome on or before the race registration but not during or after the race proper. Here’s the video from last year’s Mountain Madness – Team Challenge 10 courtesy of ABS-CBN MagTV Na! Ato Ni!